Trusted quality and value from Alion Home brand roman shade cover. Our sun shade covers are a cost effective and visually appealing way to cool and protect your outdoor living spaces and people you care about from damaging UV rays and excessive heat. 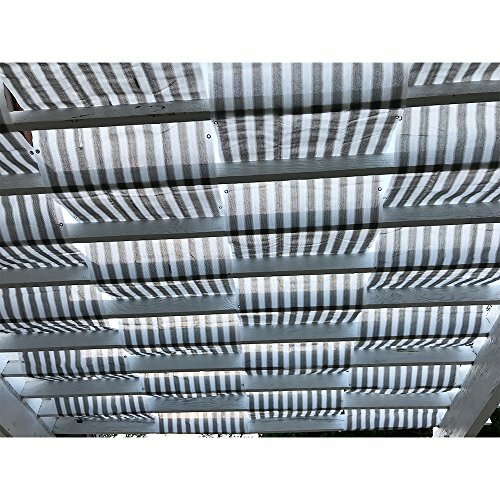 Perfect for pergolas, patios, porch, carports in windy or hot summer area such as CA, AZ, NM, NV, TA UT, CO, TX and FL, etc. Installation is simple and no maintenance is required. Allows cooling breezes and water to pass through the mesh while blocking up to 95% of UV rays. More custom lengths are available. Please contact us if you have any questions. Roman Shade Panel Cover for your existing metal or wood pergola frame, the shade cover are custom made from 200GSM breathable High Density Polyethylene (HDPE) material. UV Treated, Resistant to Mold & Mildew. Up to 95% of harmful UV rays and shading are blocked while cool breezes and rain water pass through the knitted mesh. The wave size need be about 20% longer than measurement. Provides up to 95% visibility blockage depending on lighting conditions, idea for pergolas, patio, carports, porch. Hassle-free customer service and free replacement, 3 year limited warranty under normal usage and weather. 3 ft wide and more custom lengths are available.